Tomohiko Hirata is the CEO of Ziba Tokyo. Ziba is a strategic design consultancy headquartered in Portland, Oregon USA. With a branch in Tokyo and liaison offices in Malmö and New York, Ziba’s worldwide network uniquely positions the company to provide global solutions to clients. Ziba also applies its originally developed methodology to engage clients through collaborative approaches. Ziba Tokyo also organizes workshops, lectures, and seminars for governmental agencies and education facilities, such as Waseda University’s Graduate School of Letters, Arts and Sciences and Kyoto University. In November 2018, Ziba Tokyo was invited by Saudi Arabia to hold a lecture at Asbar World Forum. 1983 Graduated from the Faculty of Arts at Aichi Prefectural University with a major in Design. He was then employed at Canon Inc. and led design projects featuring video equipment for office use. 1989 Employed at Bridgestone Corporation and developed a VI Project for IndyCar Race at the PR Department Design Center. Moved to the USA to advance the project and started to simultaneously work at Ziba’s US office. After returning to Japan, Tomohiko launched the Product Design Center at AXIS, as Bridgestone Design Center merged with AXIS. In 2006 independently founded Ziba Tokyo. Tomohiko Hirata has received many awards including Copy of The Year, G Mark, G Mark Grand Price, Reddot, IF, and ADEA. 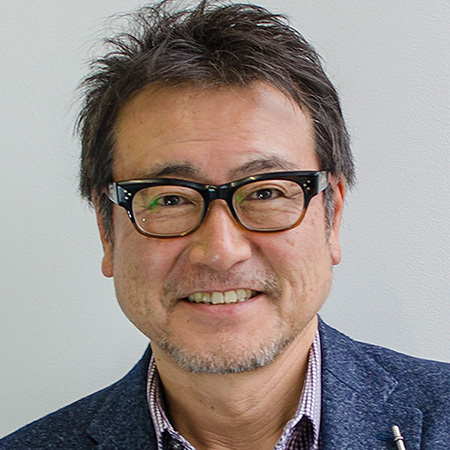 He has also authored several books such as “Creation of Appealing Experience Value”, “The Magic of White Space” (Hitotsubashi Review), and “The First Penguins: How to Create New Values” (Design Produce, Kodansha).